Jim was happy to start a third season on Jimmy Dean’s popular variety show on ABC. The first two seasons had made a star out of Jim’s character Rowlf, putting him in living rooms across the country, and that had opened up a world of opportunities to Jim. The steady work (along with his advertising jobs) gave him the means to pursue personal projects like his short film Time Piece. The Muppets were invited to appear on Jack Paar’s show several times, on Al Hirt’s program and on The Tonight Show, and to participate in the New York World’s Fair. 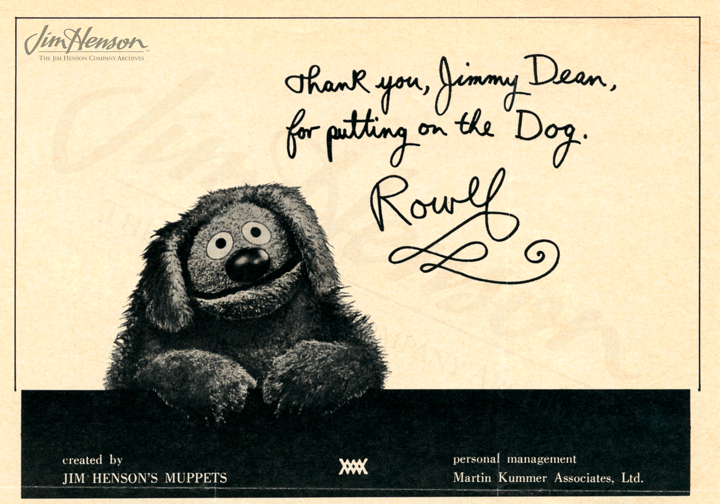 Jim helped create a pilot for a children’s show on ABC and began discussions about developing merchandise featuring Rowlf. 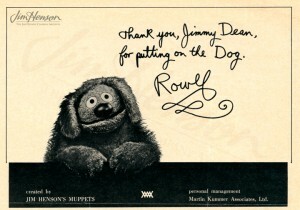 The third season on Dean would further cement Rowlf’s popularity. By 1966, Jim was performing on The Ed Sullivan Show and several other highly visible programs. Clearly, after more than a decade on television, the Muppets had found their way into American hearts and funny bones. 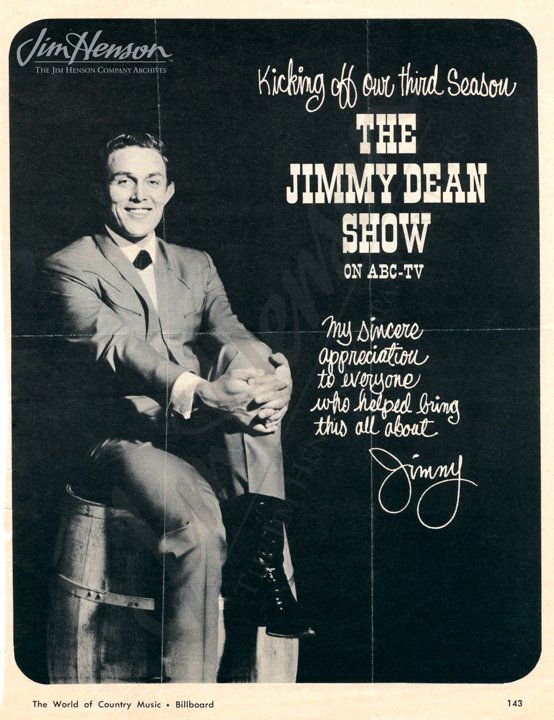 A week after the third season premiere, Jim received a letter from Billboard magazine breathlessly offering him the opportunity to buy an advertisement in their special World of Country Music edition, “…saluting The Jimmy Dean Show on its third season. This dramatic exposure will be seen by all of Billboard’s regular readers as well as thousands of country music fans who will purchase this book through special consumer promotions on radio, television and in print media throughout the coming year.” The salesman went on, “We have given you the facts, we ask only that you consider our proposal.” Apparently Jim did, and he bought a half page advertisement, despite the fact that his name had been spelled wrong (Hensen with an “e”) in the solicitation letter. Jimmy Dean’s ad in Billboard magazine, Fall 1965. Jim Henson’s ad in Billboard magazine, Fall 1965. This entry was posted in 09-September '65, 1965, Appearances and tagged ABC, Al Hirt, Billboard, Jack Paar, Jimmy Dean, New York World's Fair, The Ed Sullivan Show, The Tonight Show. Bookmark the permalink.